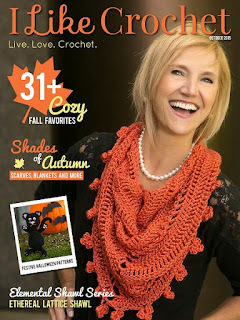 Niftynnifer's Crochet & Crafts: I Like Crochet ~October's Issue Is Great! 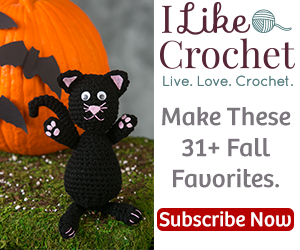 I Like Crochet October, 2015 Now Available! Make any of the 31+ fall favourites! 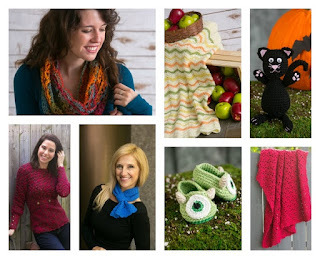 I just looked at the October issue of I Like Crochet and it is loaded with some of this fall’s coziest patterns, including the Autumn Zig Zag Throw, the Harvest Splendor Cowl, the Marsala and Cream Set (a personal favourite) and the Vine and Twigs Scarf. Cozy sweaters, like the Changing Seasons Sweater, will make sure you stay warm while the shawls and scarves feature has something to fit every style, from neck wraps and keyhole scarves to comfy Shawls. Whether you want adorable owl patterns for baby or festive Halloween accessory patterns, this issue has everything! Grab a copy today! Enjoy 31+ cozy fall favourites. Explore the shades of autumn with scarves, blankets, Hats and more. Work up the latest in our elemental shawl series, the Ethereal Lattice Shawl. Get excited about festive Halloween patterns. Check out the October 2015: Table Of Contents. This issue has to be my favourite of them all. With Halloween just around the corner and Christmas Holidays quickly approaching you may decide to gift it or just 'trick or treat' yourself to an amazing favourite magazine.